April 5, 2011, 10 a.m.
By Joshua Benton @jbenton April 5, 2011, 10 a.m. While the news industry looks at smartphone and tablet apps as a chance to build more engaged readers — and maybe even get people to pay! — for those of us who watch the business, apps are frustratingly opaque. With sites on the open web, there are any number of ways for outsiders to estimate the size of audience a news outlet is reaching. They’re imperfect, but they’re out there. But for, say, apps sold in Apple’s App Store, the only data available is pretty poor. For top sellers, you can see where they rank among other free or paid apps, but those numbers flit around from day to day. The number of ratings or reviews tell you something, but not a lot. And some of the most interesting work in the future of news is happening in these apps — for instance, in The Daily, which is trying to both create an iPad-native experience and get people to pay 99 cents a week for it. Information about The Daily’s success (or lack thereof) has been hard to come by; external guesstimates have gotten “no comments,” and the closest thing to a hard number to come out of The Daily so far is its publisher’s statement that the app has been downloaded “hundreds of thousands” of times. So I set out to see if there was some way to use publicly available data to try to understand at The Daily’s readership. If I can’t know how many readers it has, perhaps I could find something that at least showed the broader trend line. That’s how, with major help from the social media firm PostRank, I came up with the chart above, which suggests — at least when viewed through the lens of Twitter sharing — The Daily is losing audience over time rather than gaining it. To get at that data, you need to have access to the full, massive Twitter stream — or know someone who does. In my case, I reached out to PostRank, a Canadian social media firm that does interesting work analyzing how individual webpages get shared in social media. (We’re a customer of theirs — 15 bucks a month.) They were willing to help, for which I’m very grateful. 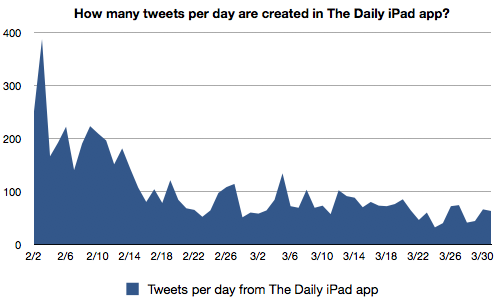 PostRank provided me with a database of every tweet generated by The Daily’s iPad app from launch day (February 2) to March 31. Before I get into the findings, a caveat. We’re measuring the number of tweets generated from within The Daily. We’re not directly measuring the number of readers of The Daily. Only a small fraction of readers are going to choose to tweet something they see in the app. The idea here is that that the number of tweets should generally go up when the number of readers go up — and vice versa. It’s possible that there might be some reason why those would diverge. Social media and Twitter are getting more popular all the time, so it might be that tweets could increase even if usage remains steady. Or the app could make its sharing button less prominent and lead to fewer tweets (although in reality the layout remains the same since launch). It’s not a perfect match — just evidence of a general direction. Got it? You can already see the broad decline. 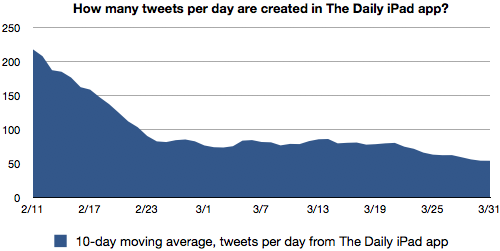 On its first full day of release, Feb. 3, The Daily generated 387 tweets. A week later, the number was 209; a week after that, 104. The trend is clearer if you look at a 10-day moving average — that is, each point on this chart is the average of the previous 10 days. (For that reason, the first point is marked Feb. 11 and covers Feb. 2-11.) A moving average smoothes out the noise. There’s a steady decline from the early peak until around Feb. 25. On Feb. 26, The Daily released version 1.0.3 of the app, which fixed some of the crashing and slowness problems that it had suffered from since launch. All in all, this doesn’t tell us how many people are reading The Daily — but it’s pretty good evidence the number has shrunk rather than grown. But there’s more interesting info in this data set than the general trend line. Tomorrow, in part 2, I’ll look further into who’s sharing The Daily stories on Twitter, when they’re doing it, how in-app sharers differ from out-of-app sharers, and much more. POSTED April 5, 2011, 10 a.m.
Benton, Joshua. "Decline, plateau, decline: New data on The Daily suggests a social media decline and a tough road ahead." Nieman Journalism Lab. Nieman Foundation for Journalism at Harvard, 5 Apr. 2011. Web. 25 Apr. 2019. Benton, Joshua. "Decline, plateau, decline: New data on The Daily suggests a social media decline and a tough road ahead." Nieman Journalism Lab. Last modified April 5, 2011. Accessed April 25, 2019. https://www.niemanlab.org/2011/04/decline-plateau-decline-new-data-on-the-daily-suggests-a-social-media-decline-and-a-tough-road-ahead/.